It's distressing enough to experience the physical changes that take place during perimenopause, but when mental functions begin to suffer, too, it can be completely overwhelming. You might not have thought much of memory lapses in your 20s, but when you're slightly older, moments of memory loss may spark fears about aging and its associated cognitive diseases. Don't worry; you are not losing your memory. During menopause, women are likely to experience frequent lapses in memory, sometimes known as “brain fogs”, and there are ways of testing to see if this symptom applies to you. 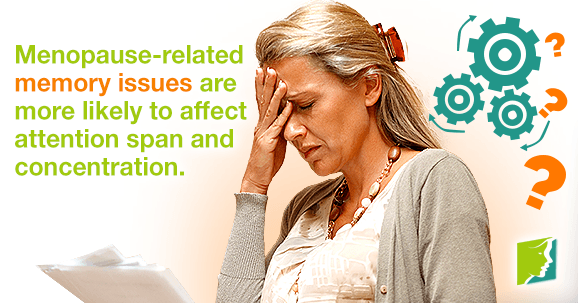 Why Do Memory Lapses Occur during Menopause? Estrogen increases blood flow to the brain to help stimulate its cognitive functions; it also boosts both the hippocampus and the neurotransmitter acetylcholine, which influence memory. Many other cognitive functions in the brain, such as attention, the ability to absorb, store, and retrieve information, and learning, are also memory-dependent. A woman's estrogen levels fluctuate and decline during perimenopause, and this imbalance means a lack of estrogenic activity in the brain, which may have a detrimental effect on its cognitive functions. Who Is Most Susceptible to Memory Lapses? Scientific research about the effects of hormone-induced memory lapses in menopausal women are ongoing, and there is still much to be discovered about perimenopause and the activity of the brain. However, findings so far show links between mood and memory. This means that women who have experienced depression, anxiety, or mood swings either during perimenopause or prior to perimenopause are more likely to notice memory lapses as they approach menopause. How Is Memory Loss Diagnosed? It is likely that you will be able to detect a change in your cognitive functions yourself, especially if you are attuned to other changings occurring in your body as you approach menopause. Those close to you may have also alerted you to memory lapses by expressing concern or frustration. However, it can be helpful to know what exactly to look for to identify memory loss. Studies have shown that the memory issues associated with menopause are not necessarily similar to those associated with amnesia or dementia, where sufferers become lost on familiar routes or forget the names of places, objects, or loved ones. Test your memory by looking for examples of inability to concentrate for long periods of time, take in new information, or process changes to routine. Menopause-related memory issues are more likely to affect attention span and concentration; having to be told information several times, struggling to complete fairly simple mental tasks (e.g., addition or subtraction) and having difficulties concentrating for extended periods of time (e.g., on a long drive or when reading a book) are symptomatic of menopausal memory lapses. Memory loss is a symptom that's associated with a number of diseases and old age, so it is perfectly natural to feel alarmed and maybe even scared when you notice lapses occurring in your memory. It's helpful to know that scientific studies and research can validate your struggles and there is a biological reason for their occurrence. It's a reminder that many other women of your age are experiencing similar issues, and that you are not alone. Can Reading Help Combat Memory Lapses? Discover why memory lapses occur during perimenopause, and learn how reading might be the solution for combating them.